go to street level from Exit 2 & 4 and take a taxi to the address below. Coming by MRT you are advised to take Exit 4 and a taxi to the address below. for the NCS Counseling Clinic in Saphan Khway. 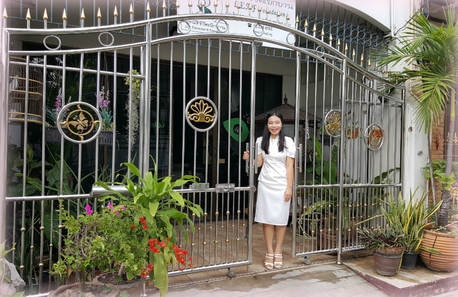 This is Lasalle Soi 3, or Soi Phon Phailin, where the New NCS Counseling Place has opened up. NCS Location 2: Counseling Place in Soi Lasalle 3/2. 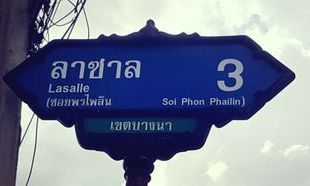 Entrance of Mooban Phon Phailin, or Lasalle Soi 3, Bangna, Bangkok. หมูบ้านพรไพลิน ลาซาล ซอย 3 บางนา ก.ท.ม. Directions: From BTS 'Bearing Station' walk back to Lasalle Road. 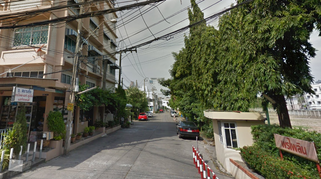 Turn right into the street and walk about 300 metres toward Lasalle Soi 3, on the left, where Mooban Phon Phailin is. Enter the Mooban and walk to the second Soi (3/2) on the left. The Counseling Place is on your right hand close toward the end of the Soi. 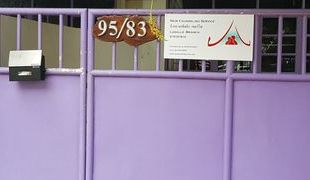 The Purple Gate has House Number 95/83 clearly printed on a sign. You may not see the NCS sign yet, but the Counseling Place is definitely there. If you have an appointment, please, enter the Lounge and take a seat there. The Counselor will call you up as soon as he/she is ready to talk to you. Feel free to help yourself to some water from the cooler.